Arson investigators want two courageous tradies who entered the Commonwealth Bank in Springvale to help victims following the devastating fire last week to come forward. 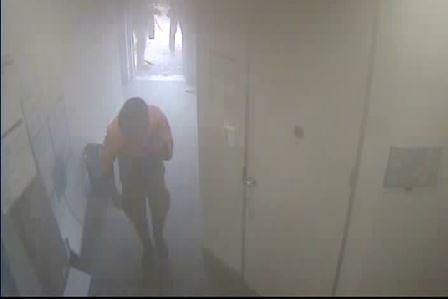 CCTV footage shows two men in high visibility clothing entering the back of the building and making their way through the smoke-filled rooms just after 11.30am. The men helped the people inside the bank and investigators said there was no doubt that the hero tradies saved people’s lives that day. Police are urging the two men to come forward in case they have information that could help the investigation. Anyone who knows who the men are or who may have information about the circumstances surrounding the fire are urged to contact Crime Stoppers on 1800 000 333.